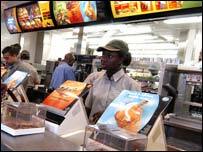 The UK arm of McDonald's is planning a campaign to have the dictionary definition of a McJob changed. The Oxford English Dictionary says it is: "An unstimulating, low-paid job with few prospects, esp. one created by the expansion of the service sector." But Lorraine Homer from McDonald's said the firm felt the definition was "out of date and inaccurate". The fast food chain is planning a public petition to try to get the definition changed. The word McJob was first used in the US in the 1980s and was popularised by Douglas Coupland's 1991 book Generation X. It first appeared in the online version of the Oxford English Dictionary in March 2001. McDonald's tried to improve the image of its employment opportunities last year with the slogan: "McProspects - over half of our executive team started in our restaurants. Not bad for a McJob."